Thank you for your repeated efforts over the last few months. It has been absolutely wonderful to receive all your amazing knitting! We really appreciate all your help and know that those who benefit from your hard efforts do too. It is wonderful to have such dedicated knitters helping our work and we are proud to say that you are all a crucial part of our initiative. We very much look forward to your parcels because we know how much time and effort you put into making the knitted garments that you send to us. It is essential that we continue to do what we do even when you might think that the climate is now getting warmer. Those with whom we work are often poorly sheltered especially refugees in Syria and Kurdistan. It is essential that they receive warm jumpers, socks, hats and big blankets to keep the cold out on chilly nights and windy days. So please keep all your knitting coming. We are especially in need of items for adults. We are also happy to receive squares and premature baby items as we are very short on these. Child school jumpers in red, blue or green are also very welcome. Twiddlemuffs are also high in demand so keep those wonderful items coming. Please note that we are unable to take anymore fish and chip jumpers (short sleeved jumpers) unless you have already finished or are in the process of finishing them. Instead, please take a look at our patterns on our website for alternatives. Unfortunately, it is very difficult to find outlets for fish and chip jumpers as many charities find that they are impractical for the babies they are intended for. Specifically the short sleeves allow the baby to get cold very quickly especially at night time. We can take them if they are already knitted. However, we don’t want to encourage anyone to knit anymore. We work with a small organisation that still takes them to Tanzania, but even they are more reluctant to take them so the more we can phase out the production of fish and chip jumpers the better. Please pass this on! If you don’t already know you may also be interested in our workshops that we are running starting from next month. Click for more details! Thank you again for your support. 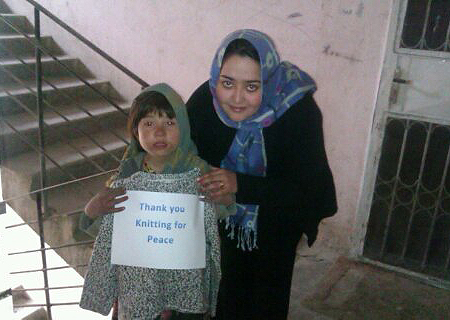 We really appreciate all you have done and hopefully continue to do for Knit for Peace in the future. We couldn’t do our work without the generosity of people like you.